Biomass pellet plant is a complete wood pellets production line assembled by a series of pellet producing equipment. Usually, there are two types of biomass pellet plant. One is called mobile pellet plant, which is welded by the manufacturer; the other is called complete pellet plant, which needs to be assembled by the customers themselves. The first type has fix parameter, while the second type is quite flexible. Customers can choose according to different needs. Mobile biomass pellet plant is designed by AGICO Group with years of experience and the study of customers’ need. It can be used to make both feed pellets and biomass pellets with a wide range of raw materials. Common pellet applications include straw pellet making, rice husk pellet making, bamboo pellet making, sugarcane pellet making, alfalfa pellet making, etc. Mobile biomass pellet plant has many functions, including smashing, mixing, tempering, pelletizing, and cooling. So it is easy for it to meet customers’ various requirements. With the mobile pellet plants, the production process of wood pellets can be highly automated, which will surely satisfy the small farms or the clients with higher requirement for automation. 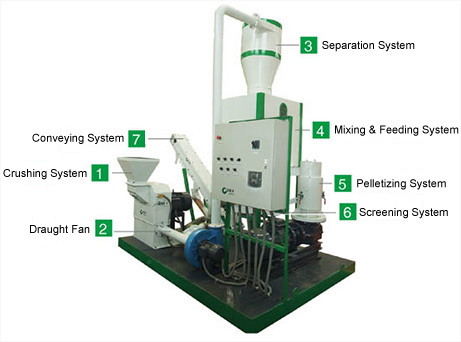 A mobile biomass pellet plant consists of a crusher, a split system, a pneumatic system, a mixing feeder, a quenching system, granulation equipment, a sorting system, a conveying mechanism, and other parts. 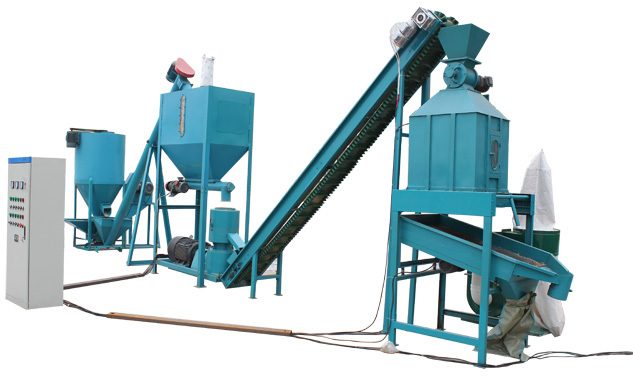 Mobile pellet plant adopts variable frequency regulating to control the key working process. It has a complete and totally reasonable technological structure. It is adaptable and suitable for making different kinds of pellets. The output of mobile pellet plant can reach 500kg to 700kg per hour. Complete pellet plant is a complete set of equipment to make biomass pellets. It is made up of crushing equipment, mixing equipment, feeding equipment, granulation equipment, and cooling equipment. The crushing equipment is a feed mill. If the granularity of raw materials is less than 6mm, then a feed mill will be needed. The mixing equipment is a fodder mixing machine. It is mainly used to mix various raw materials to make the wood pellet nutritionally balanced. The feeding equipment is a screw feeder. It replaces the manual feeding process with automatic feeding. It can raise the working efficiency and make the material more balanced. The granulation equipment is the pellet mill. It is the core equipment in pellet making. The cooling equipment is a cooling roller sorting machine. The pellets are heated when they were produced in the pellet mill, and need to be cooled to be packaged. The machine is made for customers who do not have enough space for drying. However, in actual production, we may not need all of these equipment to produce wood pellets, unless we have a large feed mill or a large-scale breeding factory. So, customers can choose the appropriate equipment according to their own needs. The combination of biomass pellet plant is completely flexible. Customers with small-scale production usually choose feed mill and pellet mill, while other customers think fodder mixing machine is useful, so they choose fodder mixing machine, feed mill and pellet mill. Different raw materials, different outputs, and different budgets can be satisfied by different combinations of the equipment. Besides, we have a new combination of equipment for feed pellets making, including crush mixing machine, feeder, stock bin, pellet mill, conveyor, and cooler. It is very practical for large or medium-sized farms and wood pellet factories. Small pellet mill: Capacity from 50-450kg/h. Apply for home use or small farm. Complete pellet plant: Capacity from 1-20ton/h. Apply for large scale of farm and commercial pelletizing factories. Briquetting machine: Apply for pellet or briquette making.